Toupee-topped politicians aside, we love the good ol’ US of A. After all, it’s the freedom-touting institution responsible for southern style BBQ, burgers bigger than our face, and the magical marriage of chicken and waffles (seriously, who funded that expedition into brilliance?). Thanksgiving hits the states on Thursday 23 November – and while our northern neighbours celebrate by inhaling more turkey than our wildest Christmas dreams, we thought it’d be appropriate to give thanks where it’s really due. We’re obviously talking about spots to stuff our faces. Pull on your stretchy pants and prepare to roll out (and everywhere for the next month). Book it for Brooklyn! With a menu that’ll have you seeing stars and stripes, it’s no wonder this South Bank spot is pumping every lunch and dinner service. With everything from towering burgers to cheeseburger empanadas, this is one borough you’ll have to see to believe. Be warned: there’s no deciding between the lobster mac & cheese and chicken ‘n’ red velvet waffles – you’re just gonna have to order both. Tucked on a street corner in Albion, it’s easy to miss this little patch of ‘murica – but trust us, you’ll want to keep an eagle eye. Sorry, dudes, but when it comes to this hideaway spot, size does matter. 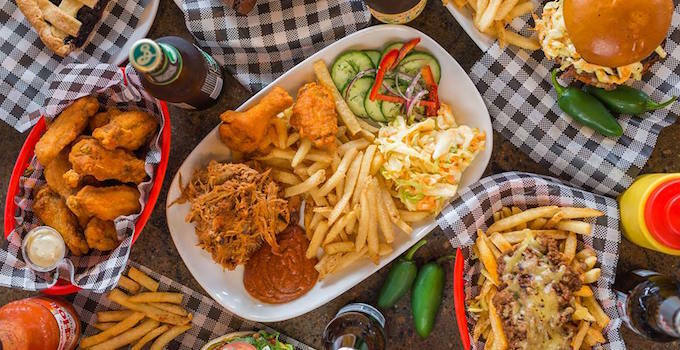 From the size of its pulled pork plates to the massive flavours behind their house made chips, corn bread, and tender brisket, your perfect USA feast is just ‘round the corner. Here today, gone to Mauii. We’ll admit, we get a little obsessed when coworkers vacation to Cali and Hawaii (damn you, Sharon), but Cali Eatery & Bar’s finally got our fix. Set in Kangaroo Point, their lush, beachy vibes are almost as addictive as the tiki cocktails. Almost. Simmer down with a packed-to-the-brim poké bowl and thank us later. Ready to join the stampede? Just off Eagle Street Pier sits Buffalo Bar, the perf watering hole for those US-style cravings. From wings to whiskey, you’re sorted: the bar’s fully stocked with imported beers and spirits to pair with those cheeky bites. Grab a beer and settle in – you’ll want to stick around for the deep fried maple ice cream with smoked butter popcorn. Anyone with a decent Caxton Street rep will pop their head up at this mention. Take a wander off the beaten path of ribs and wings for something a little different at Lefty’s. The swinging, jiving music hall is your dose of yankee country tunes – and the fresh apple juice with whiskey is just your dose of amazing. Time to tap into your Thanksgiving spirit. Sure, we’ve got nothing to do with pilgrims and pumpkin pie, but who can say no to mini Reuben sliders? Only monsters, that’s who. Pick up a frosty craft beer, some Michigan-inspired bites, and Chica-go to town. You know what they say about Thanksgiving: it’s all about that baste.